Today is the last day of Diwali. It is Bhau Bhij, the day when entire generations of our family gathered under one roof. There were as many aartis as there were generations. Men were honored by their sisters. What they got was diyas in their face, what the sisters got was envelopes stuffed with money. Well, we also bought them socks or ties, just so that the exchange was fair. The loot was then divided over all cousins and I remember feeling rather cheated when all that came my way was a measly Rs. 50. In those days, it was about US$2.50. But the excitement, the teasing, the laughter and gaiety was all priceless. I haven't celebrated Bhau Bhij for over a decade now. I have also heard that the celebrations in our extended family are rather low key now. Several of the oldest generation that held the family together, in particular my grandmother, are no more. Most of my generation are dispersed all over India and the globe. Our children do not know each other and that is truly very sad. I often think of putting together a mailing list for cousins on each side of the family...maybe one of these days, I will get down to actually doing it. Today was exhausting to say the least. My friend and I made chavde, mountains of murukku, and more roasted chivda. Then we raced to the annual Diwali function of the Boulder Balvihar that we had found out about just yesterday. The children were going to perform short skits from Mahabharata, followed by a Lakshmi Puja, where each child would perform their own puja. Medha does not attend the Boulder Balvihar but she was invited to join in, nevertheless. We plucked mums from our flower bed, put together all the samagri, scrounged for a picture of Goddess Lakshmi, and made it just in time. The evening started with the chanting of Aum, which set the mood for the evening. The children's program was fabulous. There were some individual performances, too: a Bharat Natyam dance and a voice and violin recital of Humko Manki Shakti Dena. The talent on display was very inspiring. After this each child set up their own little puja with their family sitting around them to assist them. "Vivek Uncle" led the puja, reciting the Lakshmi Ashtotram and explaining each step of the puja and we followed, reading and chanting from the document that had been sent by email earlier. Before this, I didn't know how to perform a Lakshmi Puja and I am sharing that document to help those of you who were as clueless as I was. (Some of the formatting was lost when I saved it as a Google document and I apologize for that.) The overall experience was very uplifting. A special thanks to Latha Narasimhan for telling me about the Lakshmi Ashtotram and encouraging me to find out more! Diwali of 2007 is over! It was a very special, busy and fun-filled Diwali. My husband is very relieved. No more of this kind of food till next year, right? Deep fried and ghee-laden? Yes, I agree. No more. But we know - you and I - that there will always be food on the mind! I was trying to find your email id. Do you have one? Great writeup - educational for me. You could get all your family together on facebook. I love the thali picture! And you have really so much enthu to make so much namkeen etc, wow! i like your idea of mailing list for all the cousins :). or like Saju said, get them together on Facebook. Noted for next year. I find it hard to read Sanskrit shloks or mantras in the English script - I'll look for the Lakshmi Ashtotram in the Devnagri script. Dinzie, there's always next year! The dinner after the cultural program was to die for. 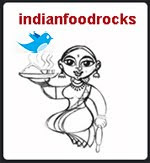 There was something from almost every corner of India - too much food, of course! Saju and Musy, facebook? I wish. I tried last year to get my classmates from my Bachelors class to keep in touch via forums. It died because everyone prefers email - hit reply to all instead of going to another site. These are people who are tech savvy, IT specialists and use computers every day of their lives. Forums serve a purpose, you don't miss any communication. If you're new to the list, you can catch up by reading older posts. But we're back to email. Sigh. And, I sent my sister an invitation to Facebook several weeks ago. She still hasn't figured out what she needs to do! So I give up. Latha, it was wonderful! Everyone knew what they were doing and why they were doing it. It made the whole puja far more meaningful than when the Pandit comes in, does his thing, and makes you do stuff. We didn't feel peripheral to the process anymore. There wasn't a single bored or whiny child in the auditorium. Anita, I'm sure there are Devnagari versions floating about. I, too, prefer Devnagari even though it takes me a while to read it but at least I know how to pronounce the shlokas. In Chicagoland, the prayers used to be in Devnagari and the Roman script, with the English translation. The kids can't read Devnagari so this is easier for them, especially as everyone was repeating after Vivek-Uncle. So pronunciation was not an issue. And, nankatais may not be deep fried but they are ghee-laden! Kribha, I'd like to flatter myself and believe that I have made an impression. 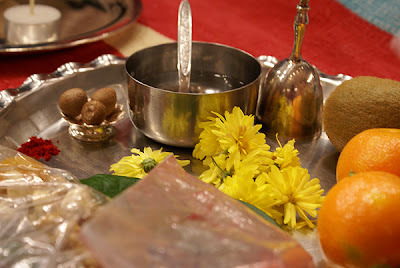 This post was all about traditions, rituals and chants. I'm glad you found it informative and enjoyed reading it! I am in the 'e-mail preferring gang too! Oh - you said 'no' to ghee-laden too - that's too bad. It'll have to be dal-roti-sabzi for a whole year then! Good luck. :D We're watching (tell D)! All the posts were lovely. Hey but you made 2 sweets and 1 chivda if Nankatai can be counted as a sweet ;). I loved the feeling of excitement that was brimming in the posts.